I own close to 400 books on nuclear power. I've read over a hundred of them completely, in case you're wondering. Take it from me: THIS ONE IS SPECIAL. Joseph J. Mangano's newest book, Radioactive Baby Teeth: The Cancer Link, is written by a scientist, and is about science, but is hardly cold and dry. Somehow in a mere 149 pages (plus ten pages of references), Mangano has written THE definitive guide to understanding what the radiation debate is all about: How we got where we are, how strong the scientific evidence against nuclear power really is, how bad the political situation really is, and what we've got to do to fix it -- he covers it all. Mangano is a gifted writer, and Radioactive Baby Teeth: The Cancer Link comes across as the detective story it is. For most of us, by the end, he has established definitively enough WHO the guilty party is -- RADIATION. But HOW can the good guys bring down the bad guys? How can WE stop nuclear power? His book is how. 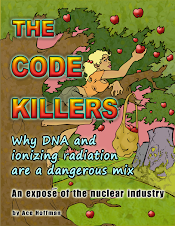 Send copies of Mangano's book to all your legislators, your governor, your local health officials, etc.. Demand that studies like the Tooth Fairy Project be done for ALL radioactive elements released from nuclear power plants (Mangano's book almost exclusively discusses only Strontium-90: How they've tried to track Sr-90, and what cancers and deaths its presence is correlated with). My local nuclear power plant, San Onofre, has had exactly ONE study of health effects around the plant done in nearly 40 years of operation. And that ONE study ONLY studied childhood cancer DEATHS at a time when medical breakthroughs were vastly INCREASING THE SURVIVAL RATE of such cancers. Death rates AT THE TIME (no longer) were, in fact, going DOWN. But INCIDENCE RATES were going up. They never studied THAT. They never studied the real problem. And TO THIS DAY SAN ONOFRE USES THAT AWFUL, BIASED, DISGUSTING STATISTICAL HOGWASH TO "PROVE" SAN ONOFRE DOESN'T KILL ***ANY*** CHILDREN! It's a lie. Okay, I'm getting excited here. You will too. Buy this book. GET EXCITED. Don't just wonder why you, or your parents, or your friends, or your child, or your sibling, or all of them, got cancer. Nuclear power could be the answer, as this book explains. In addition to his huge collection of nuclear-related books and videos, Hoffman has interviewed more than a thousand scientists on nuclear topics. He is also an award-winning educational software developer whose programs are used in hundreds of universities. His nuclear-related essays have appeared frequently on the Internet. You can buy Joe Mangano's book either through the link at the bottom of this email, or directly from the UNPLUG Salem Campaign. If you buy it through UNPLUG, Joe will autograph your copy. Cost thru UNPLUG is 20.00 plus 4.60 shipping ­ total of 24.60. Please send you check to the address below, or call me with your credit card information. Multiple quantity discounts may be available. Please let me know how many copies you need. I am pleased to announce that my latest book Radioactive Baby Teeth: The Cancer Link has just been published and is available for purchase, from Barnes and Noble for $20 (see link below). The book is the story of studies measuring radioactive Strontium-90 in baby teeth, and how these studies affected public policy. It includes research projects in the U.S. and abroad on fallout from atomic weapons tests, emissions from Chernobyl, and routine emissions from reactors (including our own study near U.S. nuclear plants). This is the first attempt to describe in-body radioactivity studies in one volume. These efforts exemplify how citizens and scientists can collaborate to generate knowledge that can effectively have an impact on critical public issues. While technical topics are covered, an easy-to-read style ensures that all citizens can understand the book. Please note that I have devoted an entire chapter to the "New Jersey story", which is an account of the concerns about health risk from the Oyster Creek reactor; the Toms River cancer cluster; the tooth study in New Jersey; and the battle over license extension. I would appreciate if your organization would post a web site notice on how to purchase the book. Please let me know if you have further ideas.